If you own or manage a craft brewery in Massachusetts, there is no doubt that you work very hard to provide your customers with the best products and services. But what about your business? Are you working as hard to ensure that the many risks you are exposed to every day won’t cripple or destroy what you have worked so hard to build? Is the right micro-brewery insurance in place? Making sure you have comprehensive brewery insurance in place that’s tailored specifically to your industry may be your most important job of all. Below are typical scenarios we hope you never have to face. But if you do, would you be fully protected by your current policy? • The first batch of your new seasonal brew is found to be tainted. The release date, the promotion, and the first batch all have to be abandoned. Are you covered for Spoilage and Contamination? • An advance release of your tainted first batch for tastings across the country has to be recalled. Does your current carrier pay for any expenses incurred for Product Recall? • After sampling several of your offerings, a customer leaving your facility is involved in a serious accident. You have mandatory limited liquor liability coverage, but is it enough? Do you need more? 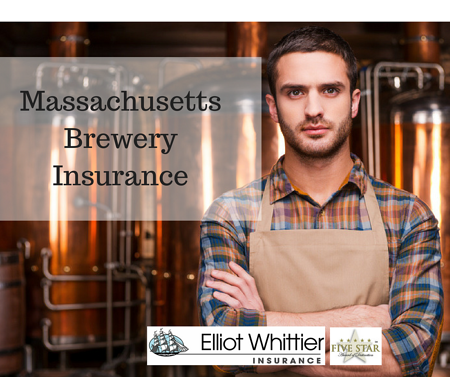 At Elliot Whittier Insurance, we understand the complex risks involved in the Craft Brewing business. That’s why we can provide access to a specialized Craft Brewers Advantage Program from an insurance company which knows your industry inside and out. Together, we’re offering customized insurance protection specifically for your type of business — coverage that goes beyond the norm to make sure your unique risks are well covered. This specialized program offers superb protection, a broad range of industry-specific coverages, affordable rates, and exceptional service. Not every insurance agency out there can get you access to this Massachusetts Brewery Insurance program. We can. Looking for options for craft brewery insurance for your business? Give us a call today at 617-846-5000. We’d be happy to assess your needs, review current policies, and design a comprehensive insurance program that keeps your business well protected, lowers your risks, and lets you sleep peacefully.